December 17, 1935 — Articles of Incorporation and Bylaws were signed. 1935-1938 — Federated shared an office with Federated Cooperative Oil Association. 1936 — Federated's first general manager, Paul Ferguson, was hired. 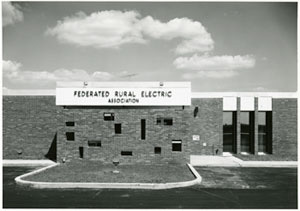 April 2, 1936 — Federated applied to the Rural Electrification Administration (REA) for its first construction loan ($50,000). The co-op had 592 stockholders. 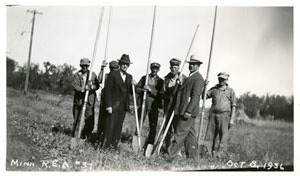 October 8, 1936 — A groundbreaking ceremony marked the first line construction near Lakefield. March 7, 1937 —The first section of line was energized from Lakefield to Round Lake. 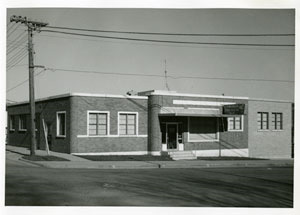 1938 — An office was rented at 607-1/2 Second Street, Jackson. April 16, 1940 — Open House at Federated's new headquarters (310 Sherman Street, Jackson). Cost: $8,000. December 2, 1941— Purchased Martin County Electric Company for $65,000, which connected Jackson and Martin Counties. 1940s — World War II causes a severe shortage of manpower. Work orders were approved on an animal unit basis for limited line construction. 1946-1947 — New service applications pour in. Electricity use skyrockets. Notices were mailed to members warning them their power would be turned off during certain periods due to the lack of power. No new members were connected. The Board pursues contract negotiations for more power. 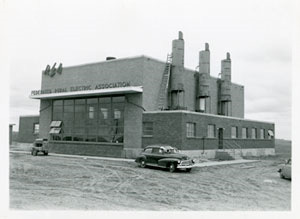 May 17, 1946 — The Board approved applying for an REA loan to purchase the Wilder Electric Cooperative for $5,000. November 14, 1946 — The City of Fairmont approved Federated's purchase of 100 miles of their rural lines for $65,000 and to supply power. December 10, 1948 — Federated requests $1.08 million REA loan to build a power plant. 1950 — Federated's warehouse and garage built near the power plant for co-op vehicles and supplies. 1952 — A fourth unit was added to the power plant for a total capacity to generate 4,920 kilowatts. July 1, 1954 — Federated received a letter from the U.S. Bureau of Reclamation (now the Western Area Power Administration) for its initial allotment of hydropower. July 31, 1956 — Cooperative Power (CP), Federated's wholesale power supplier, was incorporated. November 1, 1956 — Federated joins CP. CP starts buying electricity on Federated's behalf as a "paper co-op" since it doesn't own a power plant. 1957 — Federated received an REA award for "most efficiently operated of all REA internal combustion plants." 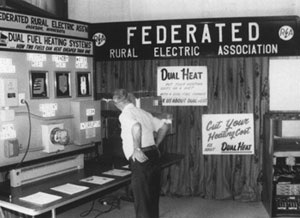 June, 1958 — Federated is featured in Diesel and Gas Turbine Progress, an industry publication, for its experienced operators and efficient plant operation. October 12, 1961 — Federated's Board of Directors approved paying the first capital credits, totaling $12,604.40 from 1941 patronage. January 1966 — Rural Minnesota News, a tabloid newspaper, serves co-op members through July 1993. March 14, 1968 — Approved first underground line construction, which was called "experimental." A contractor was hired to plow in the cable. 1969 — The Rural Electrification Administration instructs Federated to compare costs of building a new headquarters versus remodeling the power plant and selling the downtown office. September 19, 1971 — Open House at Federated's new headquarters one mile south of Jackson. Cost $252,000. 1973 — Hired an engineer that would be shared by four co-ops. This was the first sharing of an employee. 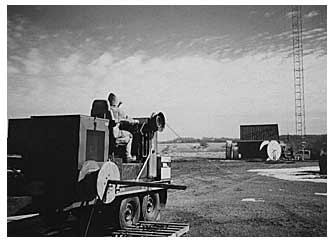 1973 — First all-electric grain dryer was installed on Federated's system. 1974 — Planning begins for the construction of the Coal Creek Power Plant near Bismarck, North Dakota, and for the direct current (DC) transmission line to deliver the power to Minnesota customers. January 10-12, 1975 — This "Super Bowl" blizzard caused more outage hours (39,930) than an average year's worth of outages. April 15, 1976 — The Minnesota Public Service Commission approved Federated's request to move from self-billing to centralized billing. 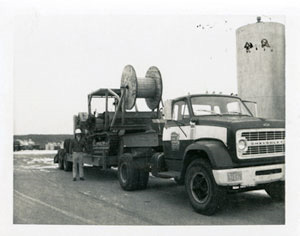 Mid-1970s — Controversy arises on the DC power line construction built from Coal Creek. Energy crisis hits. January 4, 1977 — A resolution is mailed to members advising of a possible power shortage for the fall of 1978 if DC power line construction was halted. Conservation was encouraged. October 11, 1977 — Federated's board passed a resolution to promote conservation and energy efficiency. December 8, 1977 — The Energy Alert Program was introduced at the Annual Meeting asking members to curtail energy use during peak periods. 1979 — The first unit at Coal Creek Power Plant comes online. January 25, 1979 — Federated's directors approved hiring a full-time employee to work with the membership on conservation and efficient use of energy. 1980 — Dual Heat Program is born. 1981 — The second unit at Coal Creek Power Plant comes online. September 30-October 2, 1982 — First Coal Creek Tour occurs for members to visit the power plant in North Dakota. 1983 — Federated installs first radio receivers to control water heaters. 1984 — Federated unveils a program to install/maintain water heaters. Mid-1980s — Due to the farm crisis, Federated approves an economic development loan program. 1988 — Federated offers Rural TV programming for satellite C-band (large) dish owners. 1989 — Federated adds the storage water heater program. October 1992 — Federated and three co-ops buy the financially-troubled Watonwan Television Improvement Association. Cooperative Television of Southern Minnesota (CTV) is formed to operate the Godahl Tower. August 1993 — The first Joint Task Force Meeting is held. August 1993 — Federated adds a pitched metal roof to its Jackson office. August 1993 — Federated Focus, a 16-page two-color newsletter, serves co-op members (until July 1997). August 1993 — First issue of Federated Focus published. May 1994 — A new grant/loan program from Federated's power supplier helps members switch to energy-efficient lights, motors and equipment. September 1994 — Members participating in new Operation Round Up program see their electric bills rounded up with the spare change going to local projects. December 1994 — The first generator is hooked up under Federated's new interruptible rate program. April 1995 — CTV construction completes UHF towers in Jackson and Frost, expanding coverage area. July 27, 1995 — The Board approved a genset financing program that involves a lease-to-own plan. August 18, 1995 — Cooperative Power and Dairyland Power Cooperative announce plans to combine power plant resources and save an expected $60 million over 10 years. January 1996 — Cooperative Alliance Partners (CAP) formed. CAP is four neighboring electric cooperatives (Brown County REA, Sleepy Eye; Federated, Nobles Cooperative Electric, Worthington; and South Central Electric Association, St. James) working together to serve members more efficiently and cost-effectively. June 1996 — CTV offers six UHF scrambled TV channels, called CTV Plus, to subscribers from the Godahl tower. April 1997 — Members have different options for paying their bill: Auto Pay, Even Pay and by credit card. July 1997 — Federated offers two-way communications to members with Alpha Wireless. August 1997 — Connections, a 16-page two-color newsletter, is formed with three other electric cooperatives (Brown County Rural Electric Association, South Central Electric and Nobles Cooperative Electric). This award-winning publication lasts through December 2008. March 1998 — Federated and nearly 500 other cooperatives endorse Touchstone Energy as a national brand. July 1998 — Federated puts its first website online and upgrades its office network and server. January 1, 1999 — Cooperative Power and United Power Association consolidate becoming Great River Energy, one of Federated's wholesale power suppliers. March 1999 — Federated partnered with eight other electric cooperatives to form Heartland Security Services. March 1999 — Changed the electric bill style from a carbon printed bill to laser-printed bill with yellow reuseable envelope to save costs on monthly bills and provide better quality bill. May 1999 — Federated purchase Hamples in Jackson to offer appliances, electronics, lawn mowers and more to members. June 2000 — Federated joins six other electric cooperatives to become part owner of Karian-Peterson, a power line construction contractor, and Carr's Tree Trimming Service. November 2000 — Federated offers CommLink, a long-distance telephone service, to members. June 2001 — Federated joins Nobles Cooperative Electric in sharing its general manager. June 27, 2002 — Hosted Family Fun Night, which treated members to a picnic supper, T-shirts, a tour of the Federated office and entertainment. September 2002 — Installed ground-source heat pump to replace 1970 office heating/cooling equipment. November 1, 2002 — A substation for Cenex Harvest States is built near Fairmont. January 2003 — Federated's largest single load, Cenex Harvest States soybean crushing plant near Fairmont, starts producing. January 2003 — Received a $15,000 grant from the state of Minnesota to work toward a paperless filing system using digital storage on DVDs, saving paper, money and time. February 2003 — Energy Star Appliance rebates are offered for the first time. May 2003 — Created "We Support The Troops" banners and placed them at local schools and businesses to collect signatures and well wishes. The banners were then mailed to the Middle East. Federated won an Award of Excellence on this project. June 27, 2003 — Awarded a $500,000 USDA Renewable Energy grant to build a wind turbine in service territory. July 2003 — Federated installs its 100th genset. June 2004 — Extended wholesale power contract with Great River Energy until 2045. 2005 — Received $2.5 million Clean Renewable Energy Bond to finance Federated's Welcome Wind Turbine. August 7 & 20, 2005 — Hosts "Good Ole Days" at Jackson and Martin County Fairs to celebrate Federated's 70th Year Anniversary. March 2006 — Heron Lake BioEnergy substation built. March 2006 — Federated received a 90 out of a 100 in the American Customer satisfaction Index. The average score for utilities is 72. November 2007 — Buffalo Lake and VeraSun substations built. January 2008 — Federated sells CFLs to promote energy savings. February 2008 — Federated Wind Turbine construction begins. June 2008 — Federated takes part in Operation Minnesota Nice, delivering 1,500 items consisting of food and personal hygiene products for U.S. troops serving in the Middle East. October 2008 — Federated breaks ground on new warehouse addition. January 2009 — Connections becomes an 8-page, full-color member newsletter serving Federated, Brown County Rural Electric Association and South Central members. February 2009 — Easy 2 Pay program introduced with online bill presentation, payments and online meter reading. March 2009 — Federated finishes new warehouse addition in Jackson. December 2009 — Federated offers annual $1,000 Basin/L&O scholarship. August 2010 — First AMR meters installed on seasonal accounts, City of Welcome and co-op read accounts. November 2010 — Federated celebrates 75th Anniversary. January 2011 — Federated adds Wisconsin Substation to its system. It was bought from the City of Jackson to serve members. April 2011 — Federated wins state's Leroy Vanderpool Excellence in Safety award. July 2011 — Federated installs Outage Management System. September 2011 — Federated introduces Touchstone Co-Op Connections savings card. 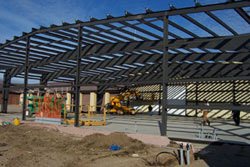 October 2011 — Federated constructs new rainwater drainage system for grounds. 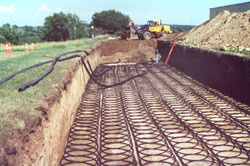 November 2011 — Federated lays underground loops for a ground-source heat system for its Jackson warehouses. December 2011 — The last main AMR meter is installed. January 2012 — Co-op's last main meter changed to AMR meter. April 2012 — Federated introduces new Exede Satellite Internet service to members. 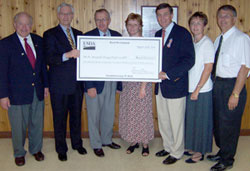 June 2012 — Federated presents $740,000 USDA economic development loan to AGCO of Jackson. October 2012 — New ground-source heat pump for warehouses wired into service. 2013 — Federated begins to use an Outage Management System, which displays outages on a computer in the office automatically. March 2013 — Federated wins National Rural Electric Cooperative Association's Community Service Award for Community Investment for its work with AGCO. Federated also received the Rural Electricity Resource Council's Silver Switch Award for the AGCO loan. 2014 — Federated begins to switch to digital maps. May 2015 — Federated, as part of Southern Minnesota Energy Cooperative (SMEC) purchases Alliant territory. Federated begins serving the towns of Heron Lake, Okabena, Sherburn, Northrop and Granada and their 1,700 member-owners. May 2016 — Federated begins to convert its billing system to PCS. September 2016 — Federated starts to serve the towns of Dundee and Kinbrae. May 2017 — Federated unveils smartphone app, which members can use to pay their bills. August 2017 — mPower does a system inventory for Federated, GPSing the system for use with digital maps.